Impressions of K-70 silver finish? Any K-70 silver owners who can comment on the appearance and feel of the finish? Is it metal or plastic? Does it feel cheap? And is it stylistically compatible with the silver Limiteds? Thank you! Planning to get a K-70 but haven't decided on black vs. silver. I have the silver one. The body is poly-carbonate like the K-50 and K-30 before it. The finish is flat and very slightly rough to the touch unlike my crystal blue metallic K-30 which is super shiny and smooth. 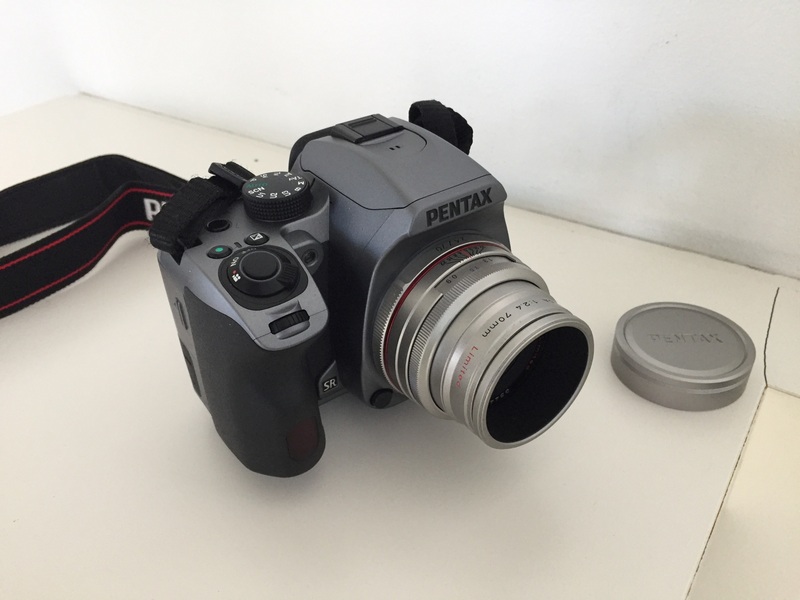 It does not feel cheap at all and is as solid in the hand as any Pentax. I can't comment on the silver Limiteds as all my Limiteds are black. I got mine just before Xmas and so far I've been very pleased with it. And is it stylistically compatible with the silver Limiteds? I have that doubt too, can any one post some pictures of it? Thank you. Thank you, Tako, that's really helpful! Thanks, BATMON. I answered my own question, too, by buying the K-70 and 20-40 Limited. The two silvers are not even close...although the texture is similar, and the K70 doesn't feel plasticky or cheap at all. I tend to think the silver 20-40 looks a little odd on it, and I that black lenses will be more aesthetically appropriate. I'm excited to use the camera, though. Looking at the photos above the silver bodies seem more like dark grey to me rather then silver. 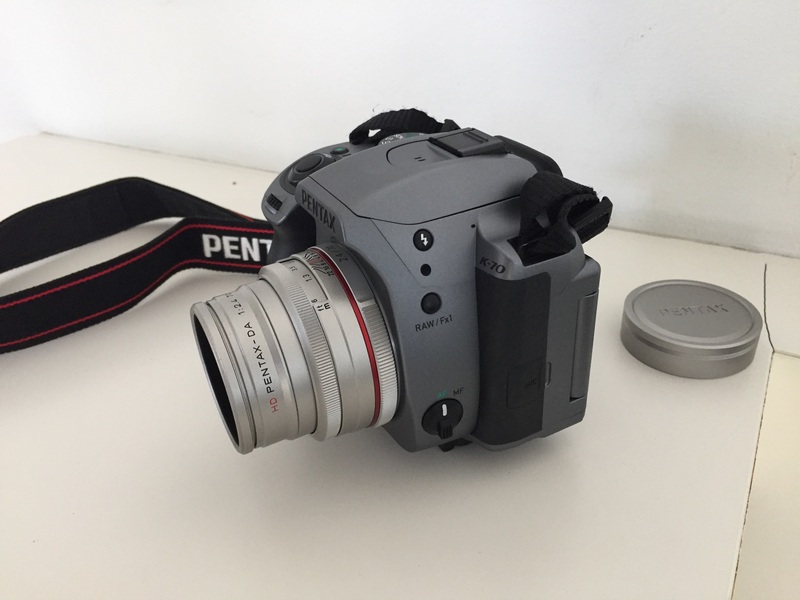 Pentax really should have made the silver bodies the same shade of silver as the silver lenses so they look like an integrated unit. Having such divergent shades of silver just looks funny. Last edited by Theov39; 01-25-2017 at 07:29 AM. I have the silver body and I agree. There's even a bit of dark blue in that finish to my eye. I quite like it, but paired with the silver lenses, it didn't feel right to me. I had hoped for more of the vintage silver look. This is so weird. I still have some silver/black polycarbonate film bodies of the ZX/MZ vintage, which did at least approximate the shade of the silver lenses. They look quite well together. Why is Pentax now behaving as if they have no clue? Well, I just discovered the newest NEW K-P! A compact APS-C DSLR with a premium price. I don't know if it has a metal body, but it has no top LCD to make it more compact, and an extra control dial like the K-1 but mounted on the front. The shutter is rated at 1/6000 sec. and remains to be determined how quiet. It looks like it will be available in what appears to be a true lighter silver color. My wife's K-70 has the blue/grey option, as an all-black body is a no-go for her. I would have preferred a more silvery finish myself, as seen with the new KP. How well the color holds up in use is unknown, and will not become apparent for some time, based on her usage patterns. I have the silver one. The body is poly-carbonate like the K-50 and K-30 before it. The finish is flat and very slightly rough to the touch unlike my crystal blue metallic K-30 which is super shiny and smooth. It's a shame they got rid of the beautiful glossy and slightly metallic "Crystal" finishes of the K-30. I have a Crystal White K-30, and I once saw a white K-50 in the store and the flat paint job did not look nearly as nice. Handling it, I also got the impression that it would scuff and show grime much easier. My Crystal white K-30 still looks practically new after 4 years and more than 70,000 actuations. Last edited by Edgar_in_Indy; 02-03-2017 at 03:32 PM. All times are GMT -7. The time now is 12:20 PM. | See also: NikonForums.com, CanonForums.com part of our network of photo forums!